Celebrating their daughter’s 100th day of birth, Wong Cho Lam (王祖藍) and Leanne Li (李亞男) hosted a beautiful banquet at Disneyland. The couple had also gotten married at Hong Kong Disneyland in 2015, so they likely chose the same venue to commemorate another milestone in their life together. Leanne and Cho Lam invited approximately 400 guests to Gabrielle’s 100th day celebration. 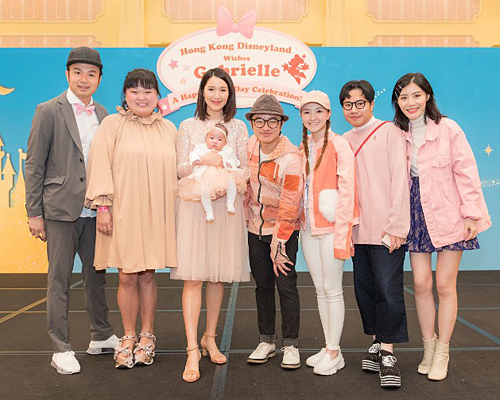 The guests who attended were: Ada Choi (蔡少芬) and her family, Sheren Tang (鄧萃雯), Roger Kwok (郭晉安), Louis Yuen (阮兆祥), Christine Kuo (苟芸慧), Alex Fong (方力申), Mimi Lo (羅敏莊), Sherry Chen (陳爽), Mag Lam (林欣彤), May Chan (陳嘉佳), Kaki Leung (梁嘉琪), Anthony Ho (何遠東), Moses Chan (陳豪) and his family, Nancy Sit (薛家燕), Law Lan (羅蘭), and Bob Lam (林盛斌). 400 guests? Wow, that’s more than many weddings. Anyways, congrats to them. She is cute and I like her, “little attitude – yes my dad is silly – face” in the picture. Side note, it is slightly amusing how Aimee is now “Moses Chan and family”. Baby really looks like Leanne. Stronger gene than cho lam. When I first saw the baby, I immediately think, “Leanne Li!” But upon further inspection, she suddenly resembles Wong Cho Lam. I mean, duh, ’cause it’s his kid lol. But made me do a double take ’cause it reminds me of those pictures where you can see two different faces lol. most important the kid is healthy. 女大十八变. Shouldn’t WCL need to wear something better than that if they’re invited so many guests over? I don’t even see Moses Chan and his family on the picture or neither of WCL and Leanne parents?